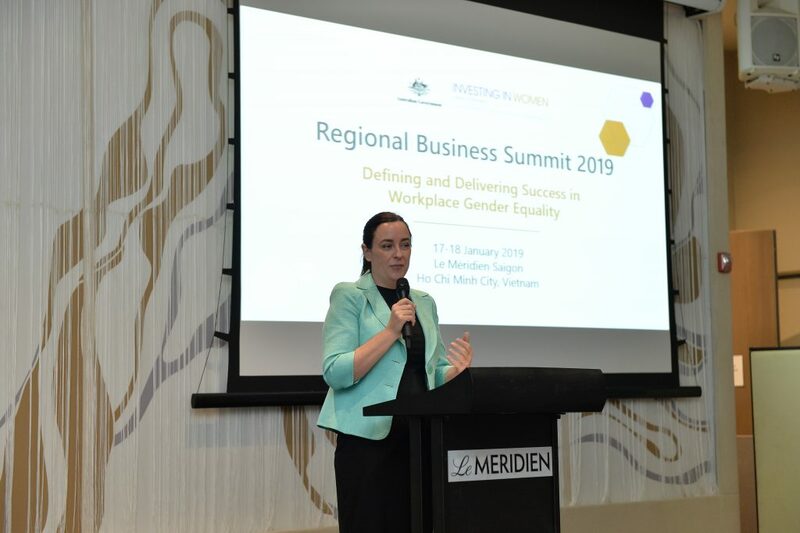 HO CHI MINH CITY—South East Asia business leaders who have committed to promoting gender equality in their workplaces have gathered here on 17-18 January for the first ever Regional Business Summit led by Investing in Women (IW), an initiative of the Australian Government. More than 70 guests joined the summit, which aims to build a South East Asia-wide community of champions and influencers in providing women and men within the region’s workforce equal access to and agency over jobs, benefits and economic opportunity. Participants included members of the four Business Coalitions that IW supports in Indonesia, Myanmar, the Philippines and Vietnam; chief executives and human resource leads of top companies in the region; and representatives of the Australian embassies. South East Asia business leaders have gathered in Ho Chi Minh City on 17-18 January for the first ever Regional Business Summit led by Investing in Women. IW organised the summit in collaboration with its licensing partner EDGE Strategy, which delivers a global benchmarking methodology and business certification standard for gender equality. EDGE, which stands for Economic Dividends for Gender Equality, works with some 200 organisations globally. The event included sessions on using EDGE Certification to strengthen human capital; understanding and measuring pay equity; identifying and communicating the business impact of workplace gender equality; and a case study on recertification. 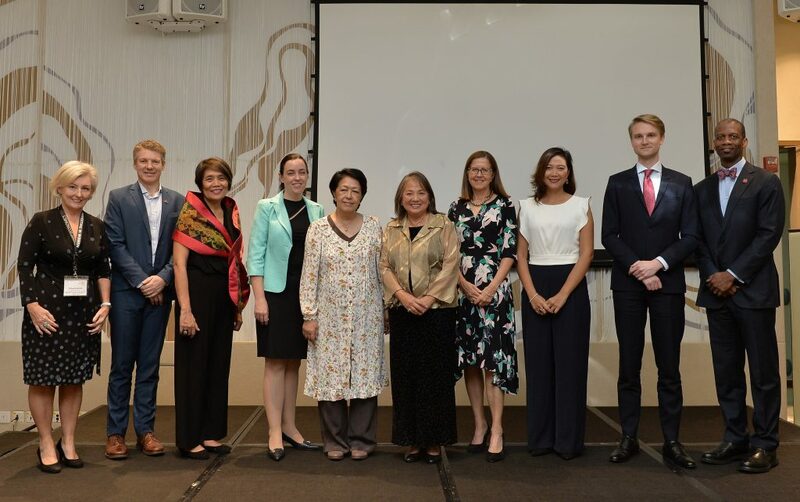 Australian Consul General, Ms Julianne Cowley, congratulates companies in South East Asia that are making a public commitment to achieving workplace gender equality. Of the 31 companies that have EDGE Certifications in South East Asia, 23 are members of the four Business Coalitions that Australia supports through IW. The Philippines currently has the highest number, with 10 EDGE Certifications, including seven for all founding members of the Philippine Business Coalition for Women Empowerment (PBCWE). The EDGE process assesses and benchmarks companies on four pillars of workplace gender equality: gender balance at all levels; gender pay gap; policies and practices to ensure equitable career flows for both women and men; and an inclusive culture. Three certification levels may be awarded: EDGE ASSESS, to companies that commit to gender equality; EDGE MOVE, to firms that achieve a set of gender equality benchmarks; and EDGE LEAD, to companies that successfully demonstrate exemplary gender equality. All EDGE Certifications in South East Asia are at the ASSESS level, except for four companies at EDGE MOVE. All MOVE-level companies in the region are Business Coalition members: Accenture Philippines, Accenture Indonesia, Adis Dimension Footwear PT in Indonesia, and Southern Airports Services Joint Stock Company (SASCO) in Vietnam. EDGE has recently signed licensing agreements with the Philippines and Indonesia Business Coalitions, which allow them to prepare companies for EDGE Certification exclusively in their countries.